Passenger rail is an essential element of America’s surface transportation system. The main provider of intercity passenger rail service is the National Railroad Passenger Corporation, also known as Amtrak. Amtrak serves more than 500 destinations in 46 states. 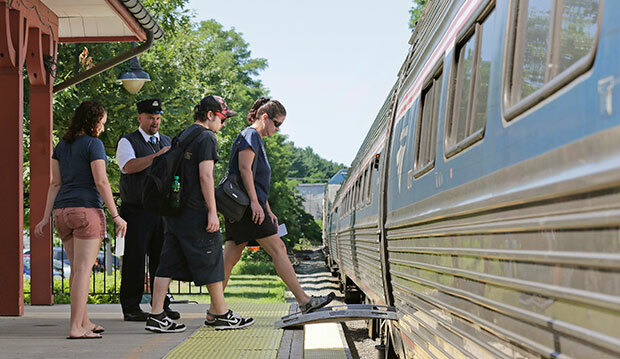 Passenger rail service supports economic development, connects rural communities to the nation, and helps reduce roadway congestion in major metropolitan regions. In addition, Amtrak facilities and services are vital to commuter rail agencies, allowing 840,000 commuters to reach their destinations every weekday. The most heavily traveled portion of the national passenger rail system is the Northeast Corridor, or NEC, which stretches from Washington, D.C., to Boston, Massachusetts. The Northeast megaregion is home to one in every seven Americans, or more than 50 million people. All told, the region accounts for $1 out of every $5 of economic productivity. Congestion within the region takes a heavy toll on the economy. 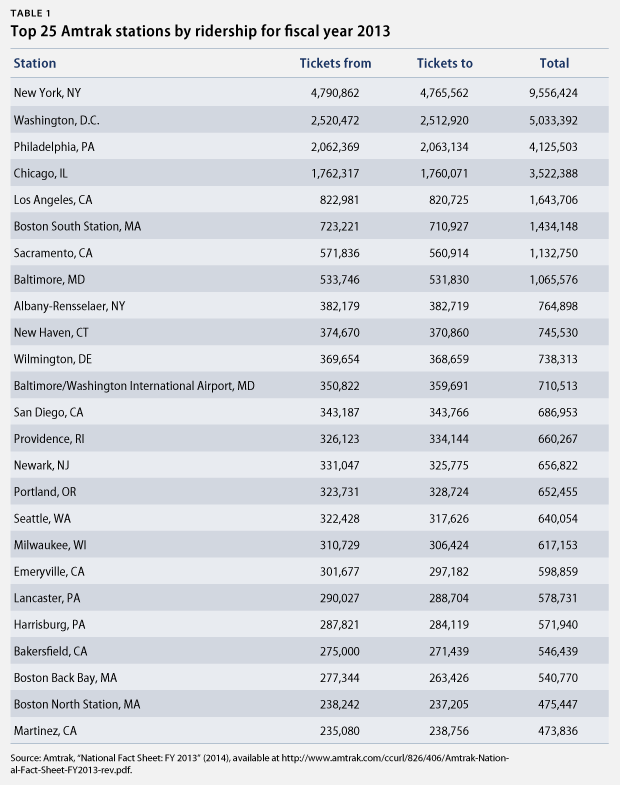 Four of the five airports with the greatest congestion and worst on-time performance—including LaGuardia, Kennedy, Newark Liberty, and Philadelphia—are located within the Northeast, and these airports account for one-third of all aviation delays nationally. The economic cost of congestion at these airports is expected to more than double by 2025, to $7 billion annually. October 30, 1970: President Richard Nixon signs the Rail Passenger Service Act. May 1, 1971: Amtrak begins operations. April 1, 1976: Amtrak assumes control of the NEC. 1977: Amtrak undertakes $1.75 billion in NEC improvements to provide regular service from Washington, D.C., to Boston. 2001: The first full year of Acela Express high-speed service along the NEC. As highway congestion within the region has grown, so has Amtrak’s role as an efficient alternative to driving. In 2001, Amtrak provided 37 percent of combined air and passenger rail trips between Washington, D.C., and New York City. By 2011, its share of combined service had risen to 75 percent. The mode share growth for the segment from New York to Boston is also impressive. In 2001, Amtrak provided just 20 percent of combined rail and air trips. This share grew to 54 percent by 2011. Policy discussions about Amtrak tend to focus on intercity rail service. While essential, these trips are only one aspect of Amtrak’s work and value. In fact, Amtrak is a leading provider of passenger rail services, including engineers, train crews, dispatching, and other operational support to transit and commuter rail agencies around the country. Furthermore, Amtrak operates commuter rail services on behalf of three regional rail authorities—the Maryland Area Regional Commuter, or MARC; Shore Line East in Connecticut; and Metrolink in the Los Angeles region. Amtrak also provides access to its infrastructure to seven transit agencies—the Long Island Rail Road; New Jersey Transit; the Southeastern Pennsylvania Transit Authority, or SEPTA; the Delaware Department of Transportation, operated by SEPTA; the Rhode Island Department of Transportation, operated by the Massachusetts Bay Transportation Authority; the Virginia Railway Express; and Metra, in Chicago. 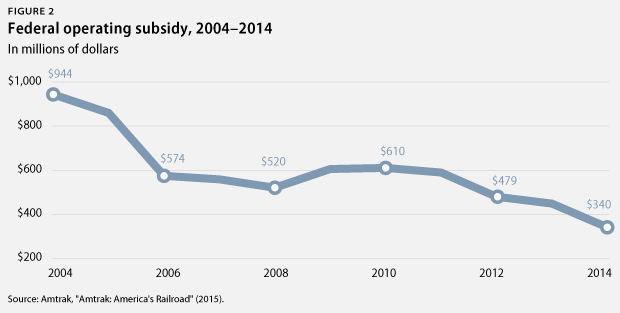 In recent years, Amtrak’s fiscal performance has steadily improved, placing it on par with other modes of transportation. This past year, ticket sales covered 93 percent of Amtrak’s operating costs. In fiscal year 2012, the most recent year for which complete data are available, Amtrak earned $2.877 billion in revenue and incurred $4.036 billion in expenses. As a result of strong revenue performance, congressional subsidies to cover operations and capital needs averaged between 30 percent and 35 percent of Amtrak’s total budget. This subsidy level is equivalent to the average provided to highways. 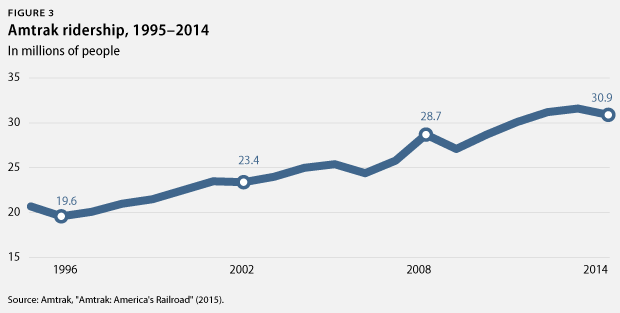 Even with recent ridership records, however, Amtrak faces many challenges. The most significant of these is a lack of adequate funding to meet maintenance needs or to plan for future system growth. In fact, since beginning operations in 1971, Amtrak has received, in inflation-adjusted terms, just $70 billion in total federal funding. To put this in perspective, since 2008, Congress has backfilled the Highway Trust Fund with $65 billion in general fund revenues to avoid insolvency. In just seven years, Congress has provided almost as much general fund support for highways as Amtrak has received in 45 years of operations. Moreover, when revenues rise as a result of robust ticket sales, Congress often uses this as a justification to cut federal support further. Inadequate funding also makes it difficult for Amtrak to comply with safety requirements, such as the installation of positive train control, or PTC, technologies. Positive train control is a communication-based technology that relies on transmitting information using radio signals to provide real-time data on the location, speed, and direction of trains. This system is capable of preventing derailments from excess speed, train collisions, and incursions into work zones, among other benefits. When Congress mandated the adoption of PTC in 2008, it did not provide any additional funding or set aside radio spectrum for Amtrak and other transportation agencies. As a result, Amtrak and other providers have had to lease spectrum at market rates from spectrum holders. In addition, Amtrak has had to choose between basic maintenance and PTC installation. Funding is not the only challenge. Unlike passenger rail providers in many other countries, Amtrak operates most of its service on tracks owned by private freight railroads, states, and other public authorities. In fact, Amtrak owns only 28 percent of the 21,300 route miles it covers. This means that Amtrak has little to no control over its on-time performance, as scheduling and track maintenance decisions remain with private companies. Amtrak serves more than 500 destinations in 46 states and three Canadian provinces on 21,300 miles of routes. Amtrak’s total ridership is 31.6 million passengers. Each day, an average of 86,000 people ride more than 300 Amtrak trains. In FY 2012, Amtrak earned $2.877 billion in revenue and incurred $4.036 billion in expenses. Amtrak-owned equipment includes 1,455 passenger cars, 416 locomotives, 80 Auto Train cars, and 68 baggage cars. Amtrak owns 23 tunnels—18.6 miles of track—and 1,209 bridges—42.5 miles of track. Seventy-two percent of the route miles that Amtrak trains travel are on tracks owned by other railroads. State-supported routes—those operated by Amtrak and funded by states—carry 15.4 million passengers. Amtrak operates 15 long-distance routes that range in length from 760 miles to 2,400 miles. Amtrak carries 11.4 million passengers on the NEC. The NEC is 457 miles long, consisting of 17 tunnels and 1,186 bridges. More than 2,200 trains operate over some portion of the NEC each day, carrying approximately 720,000 passengers, or more than 260 million passengers annually. Commuter rail demand is anticipated to grow by 58 percent by 2030. More than 25,000 freight trains use the NEC each year, hauling 370,000 tons of freight. Amtrak accounts for 75 percent of the combined airline and rail market between Washington, D.C., and New York City, as well as 54 percent of the market between New York and Boston. The 1970s were a time of tremendous change in the rail industry as competition from highways and aviation undermined demand for both freight and passenger rail service. Within a few years, many of the largest freight carriers would file for bankruptcy, pushing Congress to enact two legislative reforms that would fundamentally reshape the industry. In the 19th century, Congress granted railroad companies vast stretches of land, as well as the power to condemn private property in an attempt to fuel network expansion and westward migration. In exchange for these benefits, rail carriers were required to provide passenger rail service. The absence of effective competition from any other mode of transportation meant that this requirement was not initially a burden for carriers. However, massive postwar highway investments spurred an expansion of the trucking industry, which combined with a burdensome regulatory structure to place intense economic pressure on freight railroads. By the early 1970s, the six carriers that owned the tracks that became the NEC all entered bankruptcy. Normally, a rail company would use a bankruptcy filing to restructure its debt or, possibly, to look to be acquired by another carrier. But multiple, concurrent bankruptcies meant that there was no company capable of taking on such a massive deal, especially within the context of weak overall industry financial performance. In response, Congress agreed to remove the requirement that freight carriers continue to provide unprofitable intercity passenger rail service. In 1970, Congress passed the Passenger Rail Service Act, which created Amtrak. By May 1971, the transition was complete, and Amtrak began to provide passenger rail service across the nation. The financial relief of removing passenger service requirements proved insufficient. In 1973, Congress established a government-owned railroad corporation known as Conrail that appropriated failed freight rail operations in the Northeast, including the tract that would become the NEC. Finally, in 1976, Congress passed the Railroad Revitalization and Regulatory Reform Act, which authorized Amtrak to purchase the NEC from Conrail—effectively transferring assets from one subsidized government corporation to another. As a result of a major industry restructuring and regulatory reform, Amtrak took control of an incredibly important, albeit distressed, asset. The NEC was hampered by aging infrastructure—some pieces more than 100 years old—with massive deferred maintenance. Even with the burden of maintaining aging legacy assets, Amtrak manages to provide high-quality, timely, and essential rail service in the most heavily populated and congested region of the United States. Without this service, rail commuters would be forced to drive, adding to heavily congested roadways. Texas A&M University research reveals that 3 of the 10 most congested metropolitan regions lie within the NEC: New York; Washington, D.C.; and Philadelphia. Collectively, drivers in these three cities face 880 million hours of roadway delay per year. In 2012, the Federal Railroad Administration began a comprehensive planning process known as NEC FUTURE. This effort is intended to develop a unified vision for the entire corridor, as well as a set of specific projects needed to move the vision forward. In the absence of a shared vision and a commitment on the part of the federal government to make needed investments, Amtrak will struggle to continue to provide critical mobility to millions of people each year. The most significant barrier to improving rail service along the NEC is the more than 100-year-old Hudson River tunnels. The tunnels provide commuter and passenger rail service between New Jersey and New York City. Each of the two existing single-track tunnels is able to carry a maximum of 24 trains per hour. During the morning and evening rushes, there is simply no unused capacity that would allow the addition of more trains. Due to the age of the tunnels, one bore has to be closed every other weekend for maintenance. Adding two new tunnels would double the number of trains per hour from 24 to 48 and eliminate more than 32,000 passenger transfers. Expanded service would reduce commute times by an average of 23 minutes. In addition, the project would eliminate 22,000 automobile trips and 590,000 miles of driving every day—a significant benefit to auto commuters who already face heavily congested roadways. In addition to the Hudson River tunnels, the NEC has other major needs, including the replacement of the Portal Bridge in northeast New Jersey and the rail tunnels in Baltimore. The Portal Bridge is a movable, swing-span structure that crosses the Hackensack River, carrying 450 passenger and freight trains daily. The bridge, which requires frequent and substantial maintenance, often fails to lock in place after opening, causing severe delays that ripple throughout the entire NEC. The Baltimore and Potomac, or B&P, Tunnel in Baltimore was constructed in 1873—just eight years after the end of the Civil War. The tunnel represents a severe bottleneck, as the capacity drops from four to two tracks along this section of railway. Moreover, the tight curves in the tunnel require trains to reduce their speeds to 30 miles per hour. Taken together, these projects have a total estimated cost of more than $17 billion. In short, Amtrak’s long-term capital needs are substantial, especially within the NEC. Amtrak is a national asset that will not be able to continue to provide reliable service or expand to meet future population growth and travel demand without additional investment. This is especially true in the Northeast, where approximately one out of every three jobs in the region is within 5 miles of a passenger rail station. Over the next four decades, the region is expected to grow by more than 30 percent, adding approximately 15 million new residents. Without improved passenger and commuter rail service, this growth will lead to crippling congestion that hampers U.S. economic performance.